This is a super simple, 30 min. recipe for salmon lovers. It leaves salmon tasty, juicy with satisfying spicy crust on top. Minimum ingredients needed. I enjoy cooking creative, gourmet dishes, but I know that the beauty of food is in its simplicity. Nothing covers up the delicious flavors of fresh salmon. Clean your portions of salmon and place in oven proof dish. Sprinkle with salt, pepper and olive oil and bake in toaster oven for 15 – 20 minutes at 375 F. No need to turn over. If you don’t have toaster oven, use regular oven or grill the fish few minutes on each side. Heat a tablespoon of olive oil in wok or deep frying pan. Add rinsed and drained spinach and keep turning, so the heat gets to it evenly. When the spinach is reduced into about 1/3 of its original amount, season it with salt and 2 sliced or pressed cloves of garlic. Add wine and butter, mix together and let cook covered for another minute or two, until all the wine evaporates. 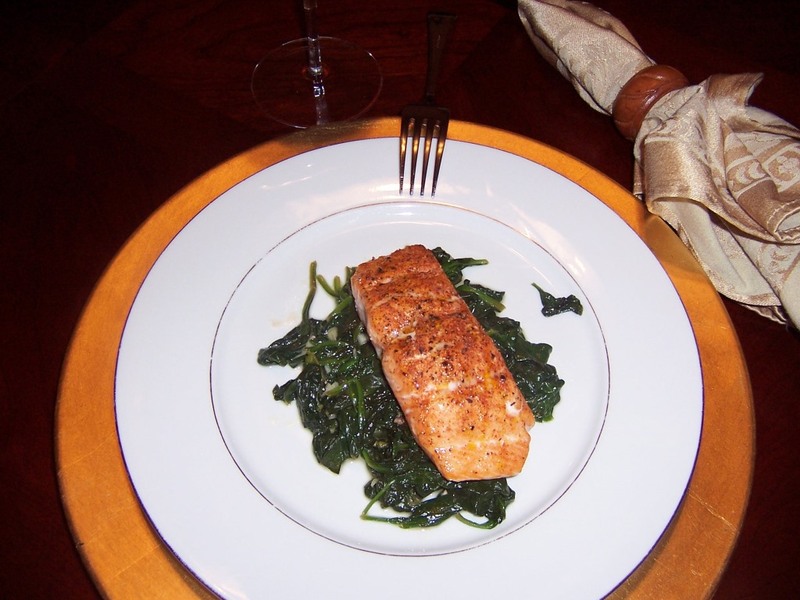 Spread spinach among your dishes and top it with salmon. Add roasted potatoes or french fries, if you like. I like to drink Pinot Noir with my salmon – and this time I chose Adelsheim Pinot Noir from Willamette Valley, Oregon. The light spice on the salmon’s crust brought out lovely spiciness of the wine and created a truly great match. Light and healthy dinner for hot evenings. For a more affordable option, I tried my favorite “Spanish Pinot Noir” from La Mancha, called Campos Reales. No, don’t let me confuse you – it’s made from Tempranillo. Its fruitiness and light body just reminds me of Pinot Noir. And you know what? It paired together perfect!